The Whistlin' Donkey Guinness Glass Engraving - Oak Beverages Inc. The Whistlin’ Donkey Guinness Glass Engraving, Friday, February 1st, 8pm. 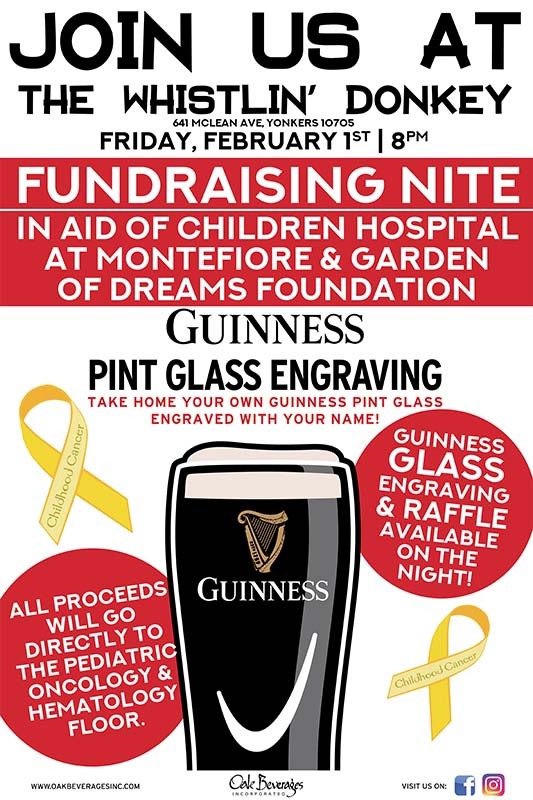 Fundraising Nite in aid of The Children’s Hospital at Montefiore & Garden of Dreams Foundation. All proceeds will go directly to the pediatric oncology & hematology floor. Irish bar in the Woodlawn – McLean Ave. area. Private party room now available for any occasion – meeting. Live music every Friday & Saturday nights. Posted in Charity, Featured Promo, Glass Engraving, Raffle.